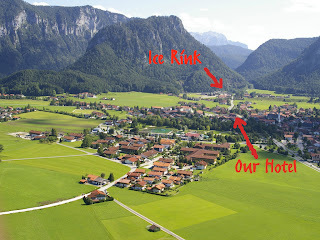 The best view of the rink in Inzell (the left side of the picture) and the surrounding beautiful landscape! to flush our the stiffness and losen up our legs. From 'bobsledding' to watching the locals celebrate Fasching (a Karneval celebration in Bavaria like that of Mardi Gras) to seeing Mozart's birthplace to eating at Running Sushi, a never-ending converter belt of food/sushi, to recovering the body in the sauna after all our training, to German Catholic mass to cross country skiing on the most perfect day, and to hours of training, it's been a packed two weeks that have flown by us. This morning we separated; the US Team traveled this morning to Heerenveen for the next World Cup while Jeffrey and I are staying back here in Inzell. Ah, it's too quite here now and sad...sad, too, that our coach and mother has left as well. Because of my frustrating season ending decision, poor mom has to be away from family for the next 4 weeks...she had not planned on this, believing I would have raced better and made the last speedskating competitions so I feel terrible now! Jeffrey will only be staying til Tuesday when he heads to Salt Lake City for the last American Cup and to hopefully get some personal best times on the fast ice! I, Nancy Jr., will continue to stay here in Inzell for 10 days working on perfecting my technique and getting my mind set for next year. The decision was made last Monday approx. and since then, it's been a process laying out my schedule for the next months and then leading into next year's season. After not really having skating success since the last Olympics (2 years ago from now), there is a need to gain confidence back by setting goals, both short and long, and achieving them. That already has started this past week by utilizing the ice time here in Inzell and working on perfecting my technique and fixing my weaknesses. We have less than two years to the Sochi Olympics and it's hurt not being able to gain momentum these last two years because of my injuries, but as I keep getting knocked down...I am getting back up. Because of the numerous trials I keep facing, there is no denying I've questioned and asked the Lord to please tell me were He wants me placed and if skating is not it, to help make that clear, for I love this sport and a more permanent trial would have to stop me. 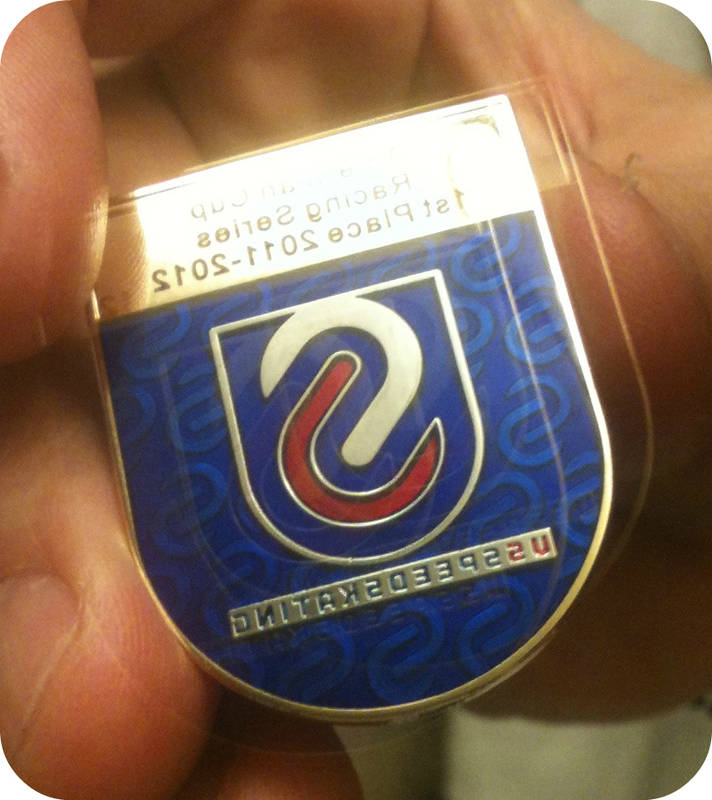 :) As of now, I am fully able...so my pursuit to gold and sharing the love of Christ with those around me, continues on! So on a more positive note (yes, sorry for this heavier-toned post), again these next weeks are going to be refreshing, focus building/goal-writing, but also there will be some fun mixed into it. On the agenda so far: watching the World Championship Biathlon in Ruhpolding (the next town over) next week, going to Munich for a day to explore, jumping in with the Inzell speedskating team for workouts the next couple days and changing up my training regiment, and then ending on a train ride to Switzerland to visit relatives and the birth place of my great-grandfather before I fly out of Munich and back home. "but He said to me, 'My grace is sufficient for you, for my power is made perfect in weakness.' Therefore, I will boast all the more gladly about my weaknesses, so that Christ's power may rest on me. That is why, for Christ's sake, I delight in weaknesses, in insults, in hardships, in persecutions, in difficulties. For when I am weak, then I am strong." Thanks to our Dutch friend Stephan Tellier for these photos he shot today. This was my second to last hard workout before America's Cup IV competition starting March 2nd. I will be easing into this next week and resting a lot to give my body adequate time to recover and feel explosive for racing...leaving for Salt Lake in 3 days! 35 seconds for the first lap to 31 seconds for the last lap. Jilleanne & Nancy before a set of laps. 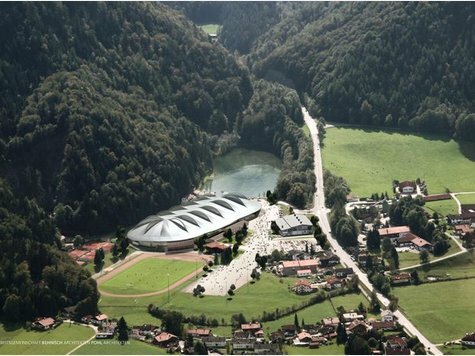 over the world are drawn to Inzell's beautiful setting and new facilities. 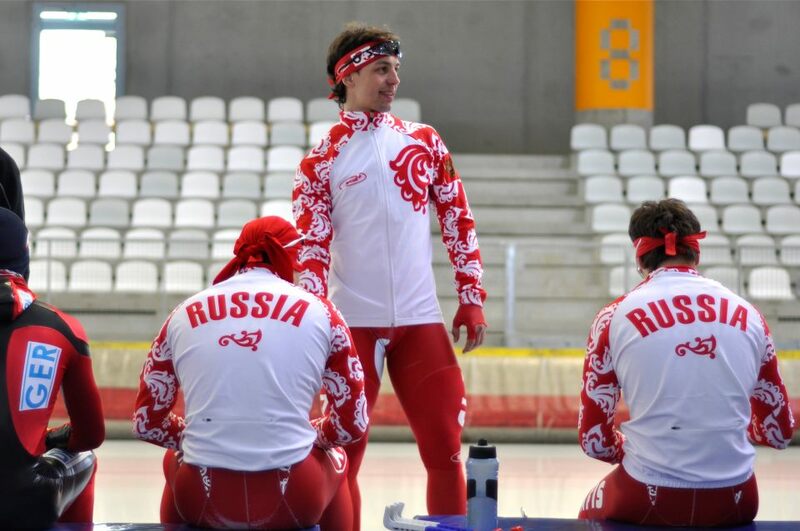 good showing for their homecrowd at the next Winter Olympics in Sochi. Russians smile or say hi when we see them, haha. Hey guys! I've been gathering clips here and there for the last couple days and quickly put them together to made a short film. By no means does this reflect very well how our training session goes every day because these are very, very random and I am no film geek with mad skills. It's also difficult when you're too focused during workouts to remember to take film, especially on the ice. But maybe you can gather a little feel of what's going on over here in Inzell. I'm planning on adding clips to this and reposting a longer video in a few days. Enjoy! Sorry everybody for the lack of posts, especially from Germany where its so exciting! We've been really busy and have internet availability only in one place. Nancy and I also really try to get pictures or video in every post but we haven't taken enough of them showing training so we've waiting on posting a little. As for the training, the speedskating season is coming to an end in a few weeks so we're giving it our last tough training week and then it's off to racing. 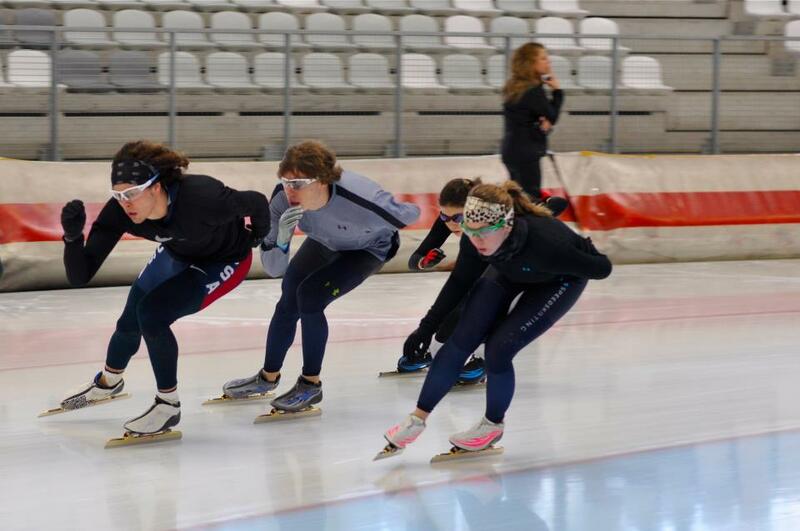 I've definitely made a big step here in Inzell with my skating, both technically and physically. Being it the end of the skating season as I mentioned, speedskaters become so accustomed to the feel of being on ice that they have the greatest ability at this point to fine tune technical issues. For example, after watching about 2 hours of film from skating on Sunday, I pinpointed a problem with my hips on the turn, fixed it the next day and I think that fix could be one of my biggest breaks this season because I've been skating so much better since then! 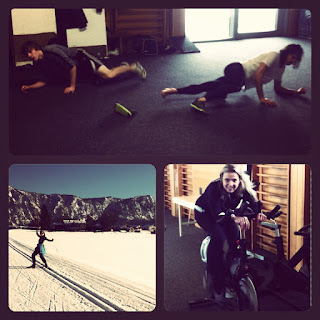 As for strength, hard training in the summer and fall pays off as we tend to skate faster with more rested muscles. Therefore, if these two aspects of technique and strength come together as planned, speedskaters can make big improvements in late winter and as for me, I feel I'm in a great position going into my last competition (March 2-4). As always, I can't forget that I am only here with the dedication of my great coach, support from countless friends and the ability God has given me. Thank you! Over the last few days I've gotten to know some of the German speedskaters (while Nancy and Brian already know most of them) and on Thursday night they invited us to join them for some..."Bobsledding." Whatever they meant by bobsledding we could never quite understand so we braced ourselves for either extreme. We figured that we might actually end up at some Olympic sized bobsledding course or maybe just a lame bunny hill with some plastic sleds. The result was more like an actual bobsledding course. We ended up at the base of a steep foothill where a German family had snow-blown a track up an old ski run into the tree-line. We grabbed some old-fashioned wooden sleds and then walked up the course for about a good 20 minutes to the beginning of the run. It was a blast! The wooden sleds got us going super fast as we plowed into the steep walls and over bumps while none of us were able to avoid epic crashes on the way down. Halfway down a band of German "kinder" hung out by the course and unleashed armfuls of snow into our faces as we whizzed past, haha. No waivers, no cost, great Bavarian hospitality and the most fun I've ever had on a sled! (Thanks Nancy Jr for the pics). Thank the Lord we arrived Monday in Inzell before the snowstorm that has lasted two days and is to continue for a couple more! All this snow is definitely making up for the lack of it back home in Wheaton, IL. Though we do have to walk to and from the rink everyday...sometimes twice a day. When the pathway has not been cleared, it definitely is like walking in sand for 15-20min. Come Tuesday, we were back on the ice in the morning. Both Tuesday and today we've jumped back into some harder training in order to bring back some condition and it is all going very well although we're all pretty sore now. The ice conditions are faster than Hamar and it is pretty warm in the rink as well. The one thing, though, that we all look forward to after our workouts is the food! I really have to give a shout out to the owner and the staff here at the Alpenhotel Gastager. They've treated us so well and the food they've been serving us is absolutely delicious...I feel so spoiled coming in from a workout and being able to just sit down and have a meal served right away! We are all loving it here in Inzell...Jeffrey, mom coach, and I were here this past July for a month training and to return to this place feels like home away from home. It is neat to see it in the winter now...snow covering everything and blanketing buildings so as to look like the idyllic pictures you usually see in magazines/books. Brian was here last March for the World Single Distance Championships and knows the area a little, but is having fun being able to explore more and definitely take advantage of the snow...tonight we had a little adventure with snow ball fights and sliding down huge banks of snow. Alex is the only one who has never been here and he is loving it more each day. 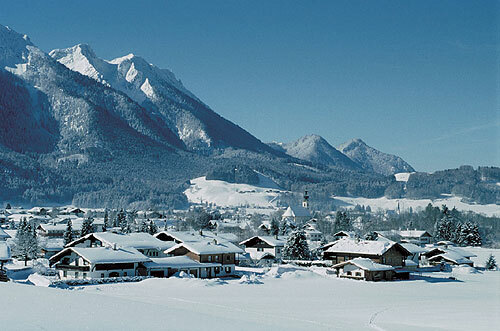 Inzell is just so quaint, peaceful, convenient, and everyone is really nice. What speedskater wouldn't want to train here? Sunday found America's Cup III coming to an end as I finished the competition with my last two races. Immediately upon finishing my last race, I had 3 hours to catch my flight to Germany to meet up with Nancy Sr and my sister in Inzell. I had my suitcases at the rink, quickly changed clothes, said goodbye to the Canadians and Americans and went off to the airport without having time to cool down my legs or stretch. Not the best way for my legs to recover after competing in 13 races over 10 days but I can deal with that! 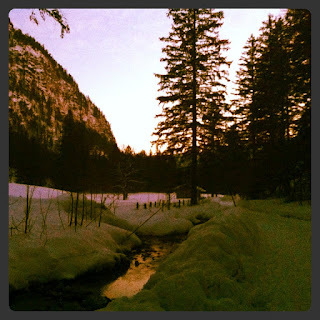 On monday, I finally arrived in Germany to several feet of snow and frozen waterfalls 'cascading' off the mountainside as we drove through the mountains to Inzell, what a beautiful place. The crazy thing was that I arrived at the hotel the same time my mom and sister arrived there from Norway. Below are a couple photos I grabbed off a google search attempt showing the Calgary Olympic Oval I raced in this last weekend. You might also remember that this was featured in one of the greatest movies ever, COOL RUNNINGS. And as quick as the World Cup started, it was finished! Time flies. There were some outstanding races even though the ice was a bit slow...Ireen vs. Nesbitt in their 1500m, Kramer vs. de Jong in the 5k, the Russians both dominated in their team pursuits, and many individuals stood out. Honestly, amongst all the nerves and craziness of the world cup, it was just fun seeing skating friends that I've missed over the years I've been away from the racing scene. Results wise, Brian dominated his weekend considering his quick comeback. From taking 3rd in the B group in the 5k to placing 9th overall in the 1500m A group today along to a 4th place Team Pursuit finish (with Jonathan Kuck and Shani Davis as teammates), Brian had a successful weekend and was pretty pumped. I on the other hand had a rough one...a weekend I would like to forget, one would say, but I'm having to face it and try to learn in order to continue my improvements as I reach towards Sochi 2014. It is killing me seeing others stand on that podium (don't get me wrong, I am happy for them! ), but I also know that if it is God's will, I will get there one day...patience, along with great technique and perfect training, and knowing God is there with me. Psalm 77:1-15. So my 3k I pretty much bombed this morning, had absolutely no feel and fell way off my pace two laps into the race. Our Team Pursuit was better for me (though I will still not on top of my game) especially considering the little amount of actual training together. Jilleanne Rookard, Maria Lamb and I placed 8th, keeping us in the running for the World Single Distance Championships late March, but we were satisfied with how we communicated during the race and who we stuck together. Much more room to improve and we intend to do so. What made today that much better, though, was seeing my awesome Norwegian friends (that are pretty much family) and finally getting to meet Ida, Mats's new girlfriend! Yes, Mats is officially ruining the great picture...way to go. Tomorrow everyone disperses...the World Championship team heads to Moscow and the rest of us (Brian, Mom coach, Alex Ochowicz and myself) head to Inzell, Germany to train for 2 weeks before heading to Heerenveen, Netherlands, for our next world cup. So good-bye from Hamar, Norway and good-bye Norway, one of my favorite places...I will miss you until next time! I'm just about to head out of the hotel to go race-prep at the Vikingskipet this morning while almost everyone else is preparing to race. This morning begins Long Track World Cup #5 here in Hamar, Norway, and feeling a little bit of the butterflies as it was the Olympics 2 years ago when I raced my last international race (but I have no doubt it will come together when I step to the line tomorrow, waiting for the gun!). Brian Hansen will be racing the 5k today along with Pat Meek. Jilleanne Rookard will be representing the US ladies, racing the 1500m. 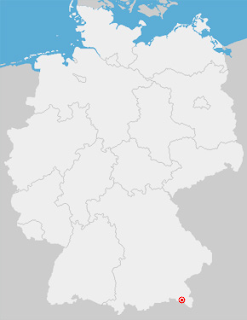 You can follow the results here. Updates and results from tomorrow will all be posted on the link as they are finished! Arrived Tuesday afternoon in Calgary to some chilly weather and a beautiful backdrop of mountains. 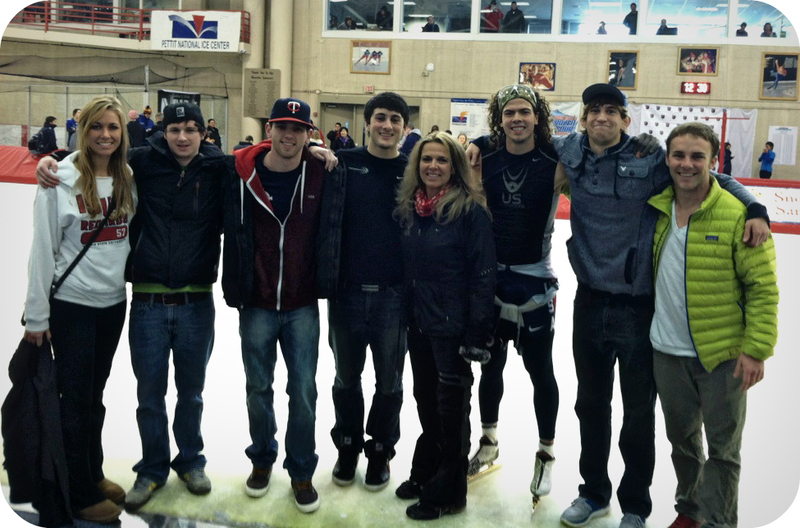 I had enough time to get settled and make the 25 minute trek from my hotel to the ice rink and get used to the ice. Above is a video I took during the ice session trying to capture how big a long track speedskating oval really is. It is a really nice and warm rink, dug halfway into the earth and attached to an array of gyms and a food court located in the middle of the University of Calgary campus. The constant presence of university track athletes training hard on the track around the rink also creates a welcome energetic atmosphere. Friday through Sunday I'm competing in the North American Championships (or America's Cup III). Today I'm on the ice for some 'race prep' or a short, explosive session to get ready for the first races tomorrow. There will be a lot of really good Canadian skaters and it will be great to compete against different speedskaters for a change! I'm also working on a 'schedule' page so everyone can keep track of where Nancy and I are, especially like now when we're in different countries. Check out the crazy month of February! Also, some of you have asked me why these competitions are significant...each of the four America’s Cup competitions allow skaters to earn points for high rankings and then eventually earn speedskating gear, training assistance and/or funding at the end of the year. So far I’m doing really well. 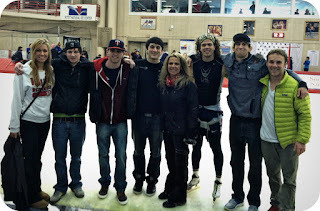 Ryan, Mom, me, Ben the goon and Jake Van Rap. 1st place in the 1000 meters! A fun fact about today is that it marks the TWO year countdown to the 2014 Sochi Olympics (it's already been two years since the Vancouver Olympics)! Crazy how time flies...and the excitement of another Olympics is starting it's spark. Just sitting down after my first full day here in Hamar, Norway and about to fall asleep typing, ha. Jet lag is torture. Though I've slept a ton last night, nothing is like mid-morning and longing for sleep all day because it is the middle of the night back home. Mom coach arrived early afternoon and after a quick nap, joined Brian and I to the 'Vikingskipet' for our first ice practice. It went well and both of us liking the slower 'work ice' because it is similar to our home ice in Milwaukee...its just a wee bit cold in the rink! Poor mom about froze to death (well, maybe not death, but close) with just an hour and a half session-coaches sacrifice a lot for us! 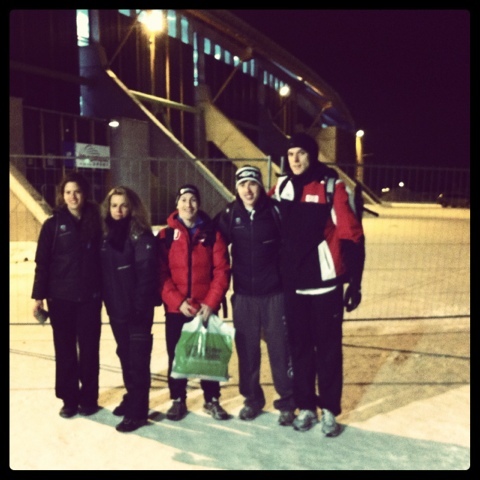 Mats (close Norwegian friend who's basically family to us, in photo below) arrived in Hamar tonight and skated as well. So great seeing him again cause its been more than 2 years, too long. Alas...I am done for tonight, way past my bedtime and need to be rested for the important weekend. Myself, Mom Coach, Mats, Brian, and Roger Schneider after our training tonight. 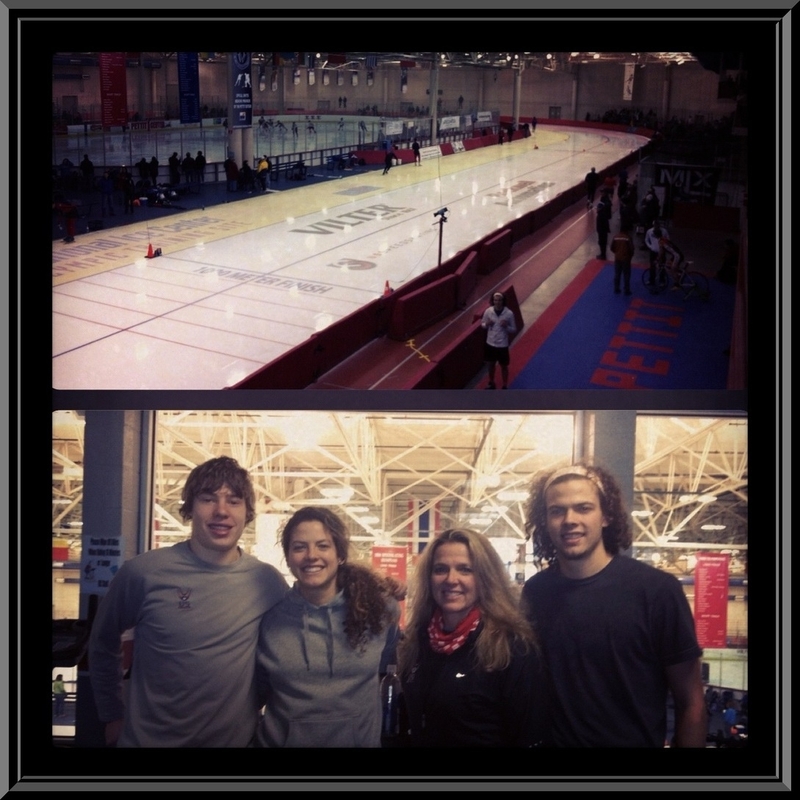 First day of American Cup II races: Jeffrey skated a solid 500 with a 37.9 and won the 1000m with a 1:13.0! My 500 wasn't outstanding...it was mainly a race prep for the 3k that I raced today. Jeffrey races one more day, tomorrow, at the Pettit for the American Cup II. Brian Hansen and I will head out tomorrow for Hamar, Norway with Team USA for World Cup #5 and stay in Europe for 7 more weeks with more World competitions to follow. 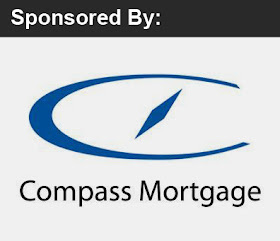 Nancy Sr heads to Norway on Monday to be with us and Jeffrey will fly out Tuesday for Calgary to race the American Cup III/ North American Championships (click here for more info. on that event...results will come later too). Today, Saturday and Sunday I am racing in a competition basically for everyone who hasn't made the US World Cup Team this year. Throughout the skating season there are four America's Cup competitions which allow speedskaters to earn points and eventually (maybe) prize money for the accumulation of points at the end of the skating season. 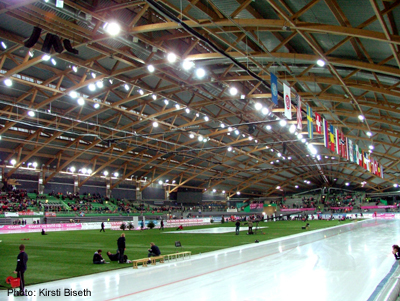 Today, I have already raced the 500 meters and I'm getting ready for the 1000 meters, possibly my best race! Tomorrow I race the 1500 meters and 5,000 meters and Sunday I repeat the 500 meters, 1000 meters and the fun "Mass Start" race. 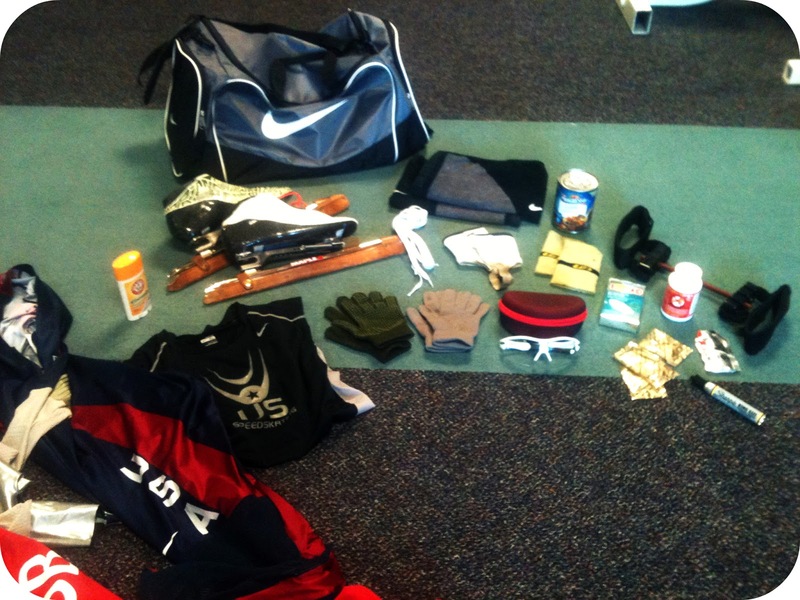 Also: Nancy Jr is racing the 3,000 meters in this competition tomorrow (Feb 4th) but not in order to earn points. Thanks so much Keri Shannon and Jen Lee for skipping classes today at Wheaton College to come all the way up here and watch my first race! That was beyond appreciated. I can't believe I forgot to get a picture with them so I could post it here. Or...what I found in my skating bag yesterday. Unfortunately there aren't any rocket boosters I can strap to my skates! (from left to right): skinsuits & Nike dri-fit, deodorant, speedskates of course, two pairs of gloves, extra laces, towels to dry skates after practice, two pairs of ankle protectors to prevent from cutting ankles during practice, Oakley sport glasses, a can of Progresso beef pot roast soup (sometimes you just need to grab food on the go, haha), band-aids for when your feet become raw in your boots, Usana AM vitamin packets, Perform Better ankle bands (great for warming up), a Powergel, and...a Sharpie? !